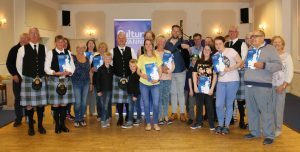 This unique publication was recently launched at the Masonic Hall in Peel as part of a weekend of workshops organised by Island based Ellan Vannin Pipes and Drums. 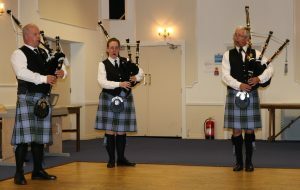 Entertainment during the evening was provided by members of the Ellan Vannin Pipe Band, visiting piper Finlay MacDonald and Island based Scottish guitarist Malcolm Stitt. 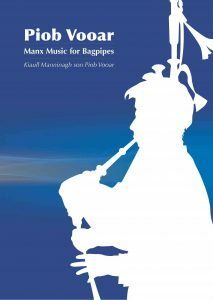 Produced by Culture Vannin, Piob Vooar – Manx Music for Bagpipes, features thirty local songs and tunes and is seen as a useful addition to the repertoire of both solo pipers and pipe-bands. The publication includes well-known favourites such as Ellan Vannin, Mylecharaine’s March, Eunyssagh Vona and the Manx Fishermen’s Evening Hymn; together with more recent compositions like Kinnoull and Irree ny Greiney, which is popular with Scottish pipe bands. Transcribed and arranged for Highland bagpipes by a graduate of the Royal Conservatoire of Scotland and a highly respected piper, David Shedden, it was edited by Dr Chloë Woolley, with additional assistance of Finlay MacDonald (Head of Piping Studies at the National Centre of Piping in Glasgow), Paul Davenport and Ellan Vannin Pipes and Drums. 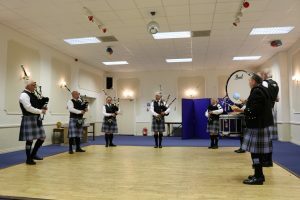 David Shedden has played with many of Scotland’s top bands, including Boghall and Bathgate Pipe Band and the Scottish Power Pipe Band. He now works as a freelance performer and piping tutor and was a finalist in the BBC Scotland Young Traditional Musician of the Year 2018. Piob Vooar (bagpipe) is available now (priced at £10) directly from Culture Vannin, or from both book shops and museum shops across the Island.